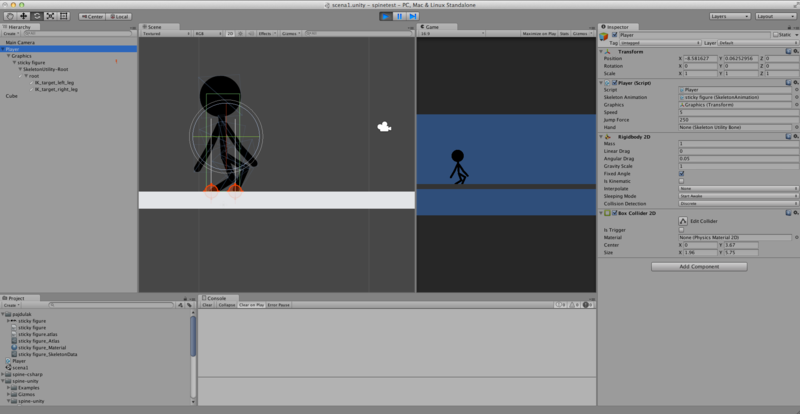 Full install package of latest Spine CSharp and Spine Unity Runtime with Examples. 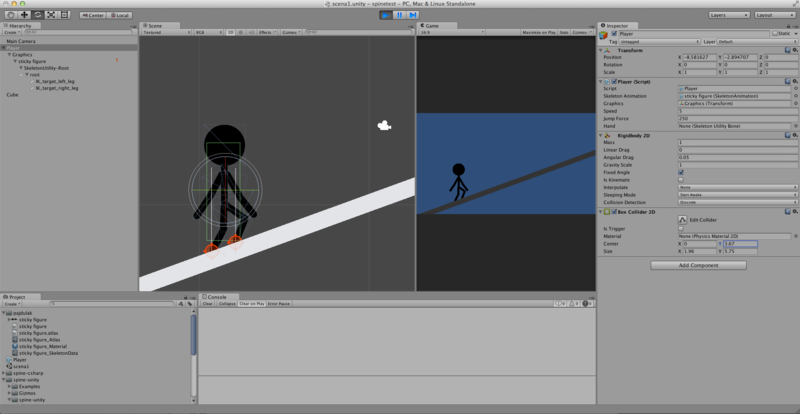 Basic Character Control with Spine and Box2D in mind. Hi, Mitch, how to bind this 'ground constaint' with 2D collider? Check the use2D parameter on ground constraint. Bunch of improvements to the importer are now on Git. Also added a Basic Platformer example with one of my current project's characters to the official repo. It's not perfect but hopefully it'll get some of that "Make a game with Spine" stigma out of the way! Please let me know if there're any problems! Once again amazing work Mitch!! Still waiting on our animator to wrap up some of the new animations, but I can't wait to dig into this stuff! Thank you, thank you, thank you! One question! Can I change the prefabs which spine imports to me? (Scale, Position). I changed some prefabs and it seems spine reseted everything to default sometime! Am I doing it wrong? wagenheimer wrote: One question! Can I change the prefabs which spine imports to me? (Scale, Position). Mm.. I thought I fixed this... make sure you're using the latest Spine Unity runtime. Could you do a walk through of rigging a character specifically using constraints, deforming one image with multiple bones. I really dig that ground constraint functionality, but here's one thing that's not really clear to me - what if I wanted to have rigidbody component on that raptor, so that I can have gravity and apply force to him? If I understand it correctly, by adding the rigidbody, the raptor would now "fall through" the platform underneath him. I would therefore need to add a boxcollider2d to the raptor, which would in turn interfere with those ground constraints - just try adding a boxcollider2d and then test the raptor on the an inclined platform - it looks weird. Or better yet, here are some pictures from our test - just a simple sticky figure. On the first picture, you see our sticky figure as he should look on a horizontal platform. However, when you rotate the platform to an inclined position, his hind leg stands out (second picture). The box collider is too low, preventing the ground constraints to do their job. 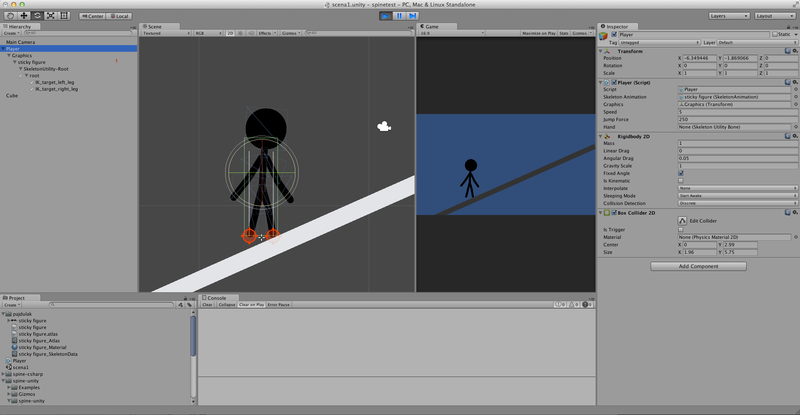 On this picture, you see the sticky hero as he should ideally look on an inclined platform - which we achieved by moving the collider a little bit higher. However, when you rotate the platform so that it's horizontal, he now looks weird (a marriage proposal, maybe?). There's no way to position the collider in a way that would look good on an inclined plane and simultaneously look good on a horizontal plane. It's either or. We also tried to substitute the box collider with a small circle collider centered at the bottom, which looked slightly better, but not perfect, especially on higher inclines. We also tried having two circle colliders, one for each leg, but that doesn't work either. Is there any way to use the rigidbody component and the ground constraints at the same time? On a different note - thanks for all the hard work! It's really awesome just to be able to play with this stuff in the editor. There are a few methods to deal with this. The first is to take care in the layer masks for ground constraint that it ignores everything except an environment layer. Seriously though I'm probably going to talk through making a gun control rig with constraints, I guess I can 2-part it and cover initial setup n stuff too. Speaking of the platformer example from Mitch. If I walk down stairs or angled platforms, the player is keep falling rapidly, what stops the player from being able to jump. Is there an easy way to prevent this? I hope I'll get them work with Mitch's platformer controller example. Hi! We're using Spine for animations at our work, and only just getting into it. Fascinating program! The programmers are running into an issue though where Unity doesn't seem to be able to process any of our Stepped/no interpolation commands in Spine. Is there some process we're missing? It would also be nice if there was a feature that allows us to remove interpolation from certain frames in our animation, on the anim side! That would be soooo sweet. @MelanieA you can select keys in the Dopesheet then in the Graph Editor set the keys to be stepped. This can be done on the white keys in the top row of the Dopesheet to affect all keys on that frame. Shiu wrote: @MelanieA you can select keys in the Dopesheet then in the Graph Editor set the keys to be stepped. This can be done on the white keys in the top row of the Dopesheet to affect all keys on that frame. I did know about these, but when it gets to the programmer, for some reason in unity it doesn't seem to recognize that particular command no matter how we put it in? In that case I think Mitch will need to take a look at it. Actually, Shiu, the programmers just retried it with the Stepped graph curve and it worked fine! XD I guess they hadn't tried that particular thing before. Thanks a bunch!!! Hi Mitch! I have been searching for an example of this all over the internet but have come out empty handed, perhaps you could shed some light. The simplest way i could explain what i want to do is what your site defines as Procedural Animation. I would like to walk and shoot/attack at the same time. If there is already an example or tutorial that shows how to do this please point me in the right direction! Thanks in advance! 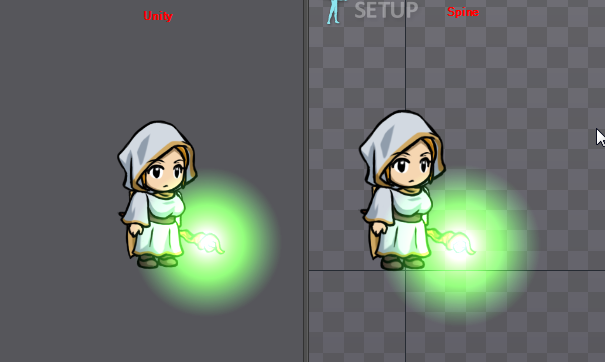 hi,how to use IK in unity? I will be posting more examples now that the runtime update is live. Starting next week heh - participating in global game jam this weekend. xEclypze wrote: Hi Mitch! I have been searching for an example of this all over the internet but have come out empty handed, perhaps you could shed some light. The simplest way i could explain what i want to do is what your site defines as Procedural Animation. I would like to walk and shoot/attack at the same time. If there is already an example or tutorial that shows how to do this please point me in the right direction! Thanks in advance!